Encompassing some of England’s best known towns like Manchester and Liverpool, Lancashire was established in the 12th century when its boundaries were finally defined. Lancashire would become one of the biggest textile manufacturing centers during the industrial revolution. Located in North-West England, Lancashire was once known as the County Palatine of Lancaster and it has a population of almost 1,500 000 inhabitants on an area of 3.080 km2. In the 19th century, when the industrial revolution gained momentum, Lancashire was one of the first towns in England to significantly profit from the back-then modern industrial machinery. England engaged in cotton textile production in mid-18th century, and Lancashire was one of the centers where it was made along with its neighbouring counties. First, the production was powered by water wheels, and Lancashire was abundant in water with its many rivers which created the ideal conditions for water-powered cotton mills. Lancashire had also an adequate work force, and the ideal climate conditions which would eventually lead to the growth of the cotton empire in the county. After the Father of the Industrial Revolution, Richard Arkwright – an entrepreneur, businessman and factory owner, introduced the first steam textile mill in Manchester, manufacturing came to a milestone. The first steam-driven textile machinery was not successful and effective at first, but it laid the foundations for machinery usage in the textile industry which would lead to mass production centers all over England and especially in the cotton-cradle Lancashire. 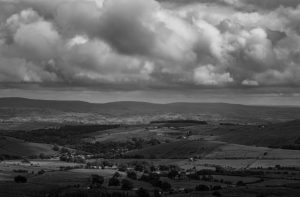 Lancashire was about to say goodbye to the romantic farmer life, to its fresh and clean air, since the modern industrial way of life was taking over the whole county. Manchester and other Lancashire towns became the most popular cotton textile centers in the world with an astonishing 32% cotton production on a global level in 1871. From the 1850s, cotton mills were opened in suburban parts of the cities and also in the neighbouring countries, leaving space for other sectors to expand in the cities. 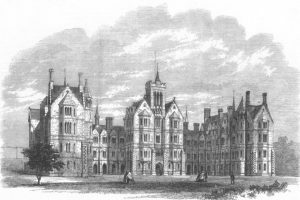 Manchester, for example, as well as other cities, became commercial centers with banks, warehouses, and other services which were at the disposal to the surrounding cotton towns. The suburban parts, also known as hinterlands, where the cotton and textile factories were moved, were called Cottonpolis. There were more than 200 cottonpolises in England in the 19th century. With the industrial revolution, life became faster and different transport networks were part of the whole system facilitating communication between distant areas. The Manchester-Liverpool railway, opened in 1830, was the first railway to run exclusively on steam power connecting the Manchester and Liverpool cottonpolises or hinterlands with the city directly representing a true symbol of progress back then. Manchester made a shift from the biggest cotton center to the biggest warehouse center. The magnificent Manchester buildings that were erected during the industrial revolution preserved their beauty even today and stand proudly as a reminder of the great industrial times. The industrial revolution, despite its many benefits, like setting the path of modern life, was not ideal for factory workers. Business owners and entrepreneurs were the ones who enjoyed prosperity and the industrial life, a way of life, carried out on the bear shoulders of regular workers. 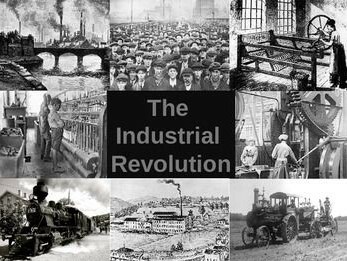 The industrial revolution accounted for organized work, discipline, a working schedule, and many other things that we as a society kept until today. But, in the wake of the revolution, workers were not protected by laws, and some would even say, that they basically were the factory owners’ property. Factory workers had to work day and night for miserable pay checks in hazardous conditions with no safety guarantee until the establishment of the first Trade Unions which were also born in the 19th century with the purpose to stop worker abuse. When it comes to the environment, the industrial revolution was marked by pollution, filthy air, smog, and the towns soon became grey under the heavy clouds of smog. Manchester was especially known for fog, polluted air, and industrial waste, and it was often labelled as the city of greed, constant work, and profit with its large industrial chimneys that seemed to never sleep. Since the cotton and textile factories in Lancashire worked with full force not knowing any limits, it came to a stop as a result of overproduction in a time when world markets were shrinking. The Cotton Famine was also called the Cotton Panic and kept the Lancashire citizens in suspense for four years (1861-1865). These were the years of the American Civil War which also took its toll on the British factories which traded across the Atlantic on the American market and relied heavily on American imports. The preceding years resulted in over-production which also led to a drop in price and value. Demand for raw cotton which had been imported form the USA, also dropped since the cotton prices went up due to frequent blockades and rare import opportunities due to warfare. The paradox of low textile prices in Britain and high raw cotton prices in America led to difficult times in Lancashire. The consequences were heavy for the workers and citizens of Lancashire since many of them lost their jobs due to bad textile market conditions, and Lancashire, once the industrial leading and most prosperous county, had become one of the most impoverished regions in England. The depression caused a true stand-still in the cities of Lancashire and many public programs were introduced to create new jobs since the majority of the population had to rely on soup kitchens and direct aid. Relief committees were formed to support the former factory workers and the towns in general. After the Cotton Famine, in 1864, cotton production and imports were restored, but by then, many towns had taken on new forms and many people had had emigrated. With a rich and abundant history, Lancashire developed into one of the major tourism centers. Manchester is one of the most visited towns by tourist from all around the world. The city of Blackpool has evolved into a major tourism destinations as well, located on the North-West coast of England. Tourism in Lancashire developed after the 19th century railroad construction that linked the major cities of Lancashire opening the door to travel. Blackpool became the favorite English resort for holidaymakers by the 20th century, not only for the British who rush to Blackpool to recharge their batteries, but also for Americans, Germans, French, and others.